Check our pool hours or join us for a class! Walk In: Rec Center Members FREE. Non-Member Adults: $10/class. Rec Center Punch Card $79/10 Rec Center Day Passes. Non-Member Seniors: $6/class. Rec Center Punch Card $49/10 Rec Center Day Passes. Fridays are FREE Senior Fridays! Aqua Fit is aerobics in the pool. Get a great total body workout without getting your hair wet! A very popular class—great for beginners and fitness pros alike. Drop in and see how much fun it is! Walk In: Rec Center Members FREE. Non-Member Adults: $10/class. Rec Center Punch Card $79/10 Rec Center Day Passes. Non-Member Seniors: $6/class. Rec Center Punch Card $49/10 Rec Center Day Passes. The Zumba version of a pool party, Aqua Zumba is a safe, challenging, water-based workout that’s cardio-conditioning, body-toning, and most of all, a ton of fun. Walk In: Rec Center Members FREE. Non-members $5/child or $15/family. Enjoy Open Swimming with families and students every Wednesday afternoon! Our goal in these classes for little swimmers is for parents and children to confidently enjoy the water together. One parent per child must be in the water. If you would like to be placed on a wait list for a session that is full, please call us at 715-779-5408. Level 1: 4:00 - 4:30pm, 5:00 - 5:30 pm (This session is full) - Students explore and learn basic aquatic skills. Level 2: 4:00 - 4:30pm, 5:00 - 5:30 pm (This session is full) - Students will successfully use primary skills and start developing aquatic locomotion. Level 3: 4:30 - 5:00pm (This session is full) - Students develop stroke readiness including elementary backstroke, treading water and diving. Level 4: 4:00 - 4:45pm - Students will build confidence and improve strokes including breaststroke, sidestroke, and turns. Level 5: 4:45 - 5:30 pm (Cancelled due to lack of registrations) - Students refine their performance of all strokes and increase their distances. Private swim lessons are available for children and adults who would like individual instruction to further their swimming ability and/or for those whose schedules do not fit our regularly scheduled lessons. Lessons are 30 minutes in length and are customized to the swimmers ability level. Please contact Isaac at isaac@recreationandfitnessresources.org or 715-779-5408 to schedule. Semi-private swim lessons are available for 2 or more swimmers with a 4 swimmer max. Swimmers must register together. Swimmers must be around the same skill level. Lessons are 30 minutes in length with a certified Water Safety Instructor. Lessons are customized to the swimmers ability level. Please contact Isaac at isaac@recreationandfitnessresources.org or 715-779-5408 to schedule. ​The Bay Area Swim Team is a competitive swim team for area youth, ages 6-18, with high-level coaching and weekend racing. Swim to compete or just for fun! Check the swim team page for all the details. Walk In: Members FREE. Non-members: Rec Center Day Pass or Rec Center Punch Card. 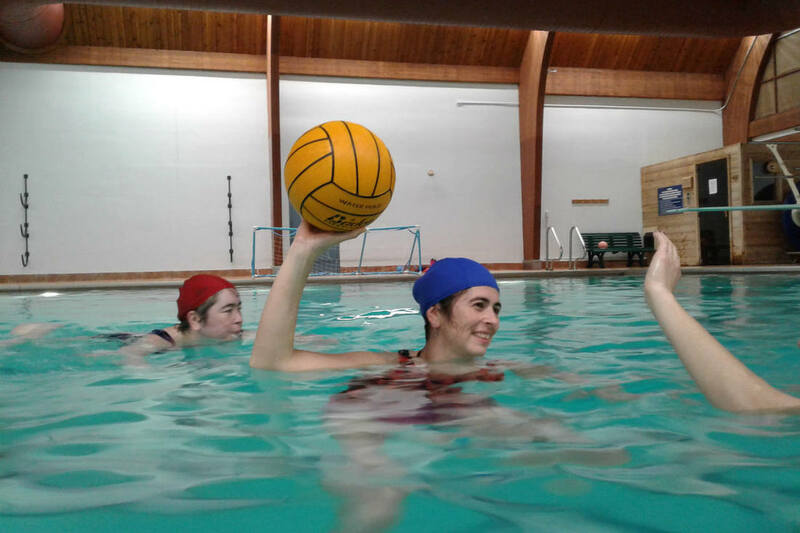 Water Polo, Log Rolling, Water Volleyball and More!